The Taurus Judge Magnum is capable of chambering both .410 gauge 2.5" or 3" shotshells and 45 Colt ammunition, this amazing combo gun is ideal for short distances where most altercations occur, or longer distances with the 45 Colt ammo. Taurus has finely tuned the rifling to spread the shot pattern at close quarters or to guide the .45 caliber bullet to the target. 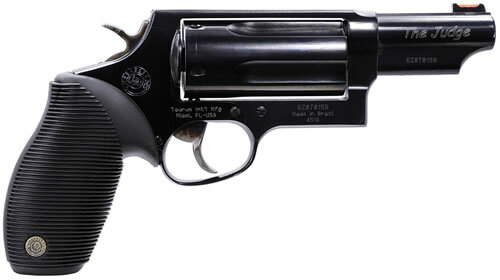 It is available with a 3" or 6.5" barrel in a blued or stainless steel finish.